FOEX 4.0 comes with lots of code optimizations & improvements, focused on reducing the initial page load and render times. Due to the extensive work we have done with optimizing our PLSQL code and the PLJSON library, page build times have been reduced from anywhere between 20-60%, depending on the number of regions, items & dynamic actions that you have on the page. Note: For our next release (FOEX 4.1), we have been performing extensive R&D on 12.2c Native JSON types and are working out how we can seamlessly switch to this new type whilst providing backwards compatibility for 12.1 and below database versions. Our initial tests they results look really promising, so when we do introduce it you can expect even more performance gains. Note: The iFrame approach is still required when you are mixing regular APEX regions with FOEX regions e.g. JET Charts, since we are not yet currently able to render regular APEX regions in Single Page Mode. In future releases we’ll look to include support for regular APEX regions as well. You can now customize your FOEX application style with the built-in APEX Theme Roller. You can change the entire look of your application with just several global level changes or use a more fine grained approach and customize at the individual plugin level. For customers which prefer a more data intensive and compact view or those who still use the classic themes we are providing two new variations of the Triton theme: Compact and Mini. Both can be styled using the APEX Theme Roller. Note: You will need to switch over to using Font Awesome / Font APEX when using these theme's to ensure that icons are sized correctly. Note: Grids rows which have changes made are now identifiable with a blue triangle in the top left corner. This is in case you are editing hidden columns using the external page items, you will be able to visually see when the grid row has been changed/edited. The navigation plugin now how an option to include a search field that will filter the navigation list based on the entry title and highlight the matches. You now have the option to include help text for grid columns. You have the option of displaying it in the column menu or on hover of a help icon above the column menu drop down. You can enable this by simply including “helpText”:”some help info” in the report column’s additional config attribute. You can find a demo on page 1520 in the FOEX Cookbook application. Since we now provide styling of the Triton theme(s) using the APEX Theme Roller we have now included a dynamic action to switch the theme style. Note: this is only supported in APEX 5.1+ since it relies on an APEX PLSQL API that was introduced in this version. We have included several new dynamic actions. The first is a set grid row values using a dynamic action. You can set multiple values in a row at a single time by providing a JSON object with “Column”:”Value” pairs. You can target rows by either using the current row selection (multirow selection is supported), a column/value search using partial or extract matching, or using a single row index or index range e.g. 0 or 0-4 or 0,1,3,5. The second is a reject changes plugin that will allow you to easily reject changes for the current selected row(s), a column/value search or the entire grid. You can see an example in our FOEX Cookbook application on page 1252 for the Grid and page 3090 for the Tree Grid. We provide a new action within the FOEX Tree Grid Actions plugin so that you can hide/show the tree root. By default the root is hidden since normally it is a pseudo element because the starting point normally is NULL i.e. Level 1 records have a NULL for the parent ID. However in cases where you do start at a level where the parent ID is not null then we provide this dynamic action so you can show this starting point. You can see an example of this in our FOEX Cookbook application on page 3012. We have also included two new events to detect before and after the root node loads. This is to eliminate the requirement for a client side condition on the regular FOEX Tree Grid - After Node Load event which fires for any node loaded in the tree. Listening to either of these events is useful for many reasons i.e. prevent the tree from reloading because of some conditional check. Or you may want to expand only Level 1 nodes when the tree loads. We now provide the ability to format and show step values for the slider page item. You can format the labels by providing a format mask. Due to the content loader change that loads pages into the current page we now include an option on the “FOEX Close Window” dynamic action to close all open windows prior to opening content via the content loader. It is now possible to set content loaders URL to the page currently loaded in the iFrame. This is useful when you are showing regular APEX pages and have navigated away from the original page loaded by the content loader. This is to ensure that on refresh of the content loader region (i.e. URL reload) the user can stay on the current page they are viewing. We have included several new demos for existing plugins as well as adding demos for new functionality. We have enabled the new content loading into the current page functionality when navigation links are opened, but have also explicitly set some demos to run in the old iFrame mode. We now provide a more visible button on the info pane title to easily edit the pages you are viewing in the cookbook application so you can easily peek behind the scenes at the page setup and how the demo was put together using the described plugin(s). When using the theme switch dynamic action we save this value to an APEX user preference named FOEX_THEME. APEX Preferences are applied at the workspace level therefore this theme preference will be applied across all FOEX applications that the user account has access to. If FOEX detects a theme preference for the user it will use this theme for the application. The Triton Dark theme is now an APEX theme style named FOEX Style 1. When upgrading FOEX from a previous version we will automatically change your application theme (if it is not Triton) for your existing applications based on this mapping. Post upgrade you can manually change the theme to your desired selection under: Shared Components -> Component Settings -> FOEX Application Settings. The reason for this behaviour change is because we provide theme roller integration only for the Triton theme. Effectively it is now our Universal Theme so to speak. This will reduce support requirements and also mean that we can include more functionality in the future that can be easily styled by you / your developer(s). Globalization of FOEX components works by using APEX Text Messages. Starting with FOEX 4.0 we have changed the way we use and output these Text Messages. This now means we have to create these text messages, if they do not already exist (previously we had used hardcoded defaults in PL/SQL), so that APEX can pick them up. The text messages are created when running a FOEX app for the first time from within an Application Builder session. On this first time you might notice that some buttons do not show the proper text, but an internal message name like FOEX.JS.GENERAL.LOADING_MSG. This is due to a timing issue where the APEX messages.js file request fires before the texts are created. Simply reload the page again with a hard browser refresh (Shift+F5) and the problem should disappear. The new option to load content into the “Current Page” means you can now load a page into a page. This is the definition/design of single page applications and the biggest design change we have added to the framework since the initial 1st release. Example: Let’s say page 30 is your main/parent page and you load page 50 (child page) into it using the "Current Page" setting in the content loader. When page 50 is loaded into page 30 the page context is still page 30, it just has content from page 50 added to it. If you open session state or edit page from the developer toolbar page 30 will be the context. The same applies when you submit the page, the context is still page 30. There is no iFrame used in “Current Page” mode it is simply loaded into a HTML element on the page i.e. DIV. This element is created by the region's layout manager which you are loading content into i.e. the affected element in the content loader dynamic action. From a technical point there is much more complexity to deal with when loading pages into the current page, the benefits outweigh this though, but you will find some situations where it will not fit, so you can fall back to the iFrame mode. Note: Another important point to note is that in the old iFrame mode there is a clear boundary between pages so things like CSS and CSS classes on the parent page don't affect the child pages. When we load content into the current page the CSS on the parent page can affect the child page loaded (and vice versa) because they are in the same HTML document and there is no separation - which the iFrame normally provides. Note: If you have open windows on child pages, which are loaded into the current page, they will not be automatically hidden when new content gets loaded into the current page. With the iFrame mode, when the content loader fetches a new page and adds this new content into a new tab/iFrame, it means that the previous tab would be hidden and as a result the window too since their page boundary was the previous tab/iFrame, not the whole page. In this version you will have a new option in the “FOEX Close Window” dynamic action to close all open windows. You can use it before the content loader action to resolve the issue described above. We have upgraded the underlying Sencha Ext JS framework from 6.2.1 to 6.5.3. This could potentially effect any custom Ext JS code you have written in your application. So please check/test your custom code. To check the full release notes which include the new features and functionality provided by FOEX 4.0.0, please click here. We have included the Drop Zone plugin to complement/replace the usage of our existing multiple file upload page item. The plugin supports the exact same features of uploading files to tables, collections, and file system. Files can be uploaded via Drag & Drop and the area to drop them is the entire space of the region, making it easier to drop them into. The dropzone area will resize according to the region size when the parent region size changes. You can now include either a static or dynamic progress bar item in toolbars or form regions to visually display the progress, usage, or completion of things. The progress bar gives you the ability to control the background/progress color, text, and animation capability. The plugin comes with an associated dynamic action plugin allowing you to update the progress and dynamically change the colors. You can set the progress check interval, limit the number of requests, and also cancel the progress using actions. A simple Font Awesome/Font APEX icon that behaves similar to regular buttons. You can add a badge to the icon to display some text or a count indicator. The icon can enabled/disabled or set to read-only to use it simply as a visual indicator. We have included another variation of our grid combo plugin which allows you to enter the ID value of a LOV and perform a lookup. This plugin is a familiar item type for Forms developers. The plugin supports the exact same features as the regular grid combo item including set other items on lookup/selection. A new date picker that allows you to display and select dates based on the Islamic Hijri calendar. When used within the FOEX Form plugin, on form load the date value queried from the database, the date pickers item value will be automatically converted from a Gregorian value to a Hijri value. On form save the form value will be automatically converted from a Hijri value to a Gregorian value. The grid will now perform all client side validation on changed rows before saving them to the server, if there are any validation failures then these need to be rectified by the user before the save/AJAX call is made. You can now select multiple rows with the grid select row dynamic action. You can select the rows by using an index range or a search based on a column/value search. The column/value matching can either be partial/exact or by using a regular expression. You can now refresh multiple rows with the grid refresh row dynamic action. You can refresh the rows by using the current row selection(s) or an index range or a search based on a column/value search. The column/value matching can either be partial/exact or by using a regular expression. Page Level Read Only conditions are now honoured by Grid & Form plugins. Please note: that read only conditions defined at the component level will override the page level condition. This will allow you to have some regions editable when the page is in read only mode. For visual and consistency reasons we have overridden the browser alert produced by the Execute PLSQL Code dynamic action when an error occurs with an Ext JS Alert. You can now base your grid cascading LOV parents based on page items on the current page, not just columns from the current grid. We have included a new dynamic action to allow you to close/disable one or more tabs based on the current active tab, ID, or Tab Text. The tab ID/Text matching can either be partial/exact or by using a regular expression. We have included a new option in the Continue IF dynamic action what gives you the chance to cancel the calling FOEX event e.g. you may listen to a “Before Refresh” event and your Continue IF action returns false you can choose the option of cancelling the refresh action using this setting. Note: this applies to all “before” events. All LOV items now support being based on a PLSQL Function returning SQL String. You can now set icons on the tabs/panels opened by the content loader that use the “Triggering Element”. You can do this by adding a data attribute to the HTML elements e.g. grid report column link e.g. You now have the option to mark form items with a visual indicator (red triangle top left corner) when their value has changed, just like grids do! The page level read only condition will now be honoured by Forms, and Editable Grids & Tree Grids. However please note that if you define a read only condition at the region or item level the result of that condition will override the page level read only result. This is the same behaviour as in standard APEX. On all region AJAX calls e.g. grid refresh, form load etc. we will check all child region/item/button conditions, authorisations, and read only conditions for the region in context and will perform the appropriate action of hiding/disabling failures and enabling/showing successes. This allows you to avoid the need to create many dynamic actions to hide/show enable/disable items/regions. This change may affect existing hide/show dynamic actions with regions/items that have an existing condition defined. As mentioned in our enhancements section, all changed grid rows will have their values validated against any client side validation rules e.g. not null, minimum length, maximum length, minimum value, maximum value. If there are any failures then they need to be corrected by the user before the grid save AJAX call will be issued. To check the full release notes which include the new features and functionality provided by FOEX 3.1.0, please click here. In earlier versions of FOEX we used PLJSON for JSON reading and writing capability in PLSQL. This meant that we had several types defined i.e. JSON which conflicted with v12.2 of the Oracle Database since a native JSON type was introduced. We have resolved this conflict in v3.0.1 and 12.2 is now officially supported. We now officially support APEX 5.1 from this version onwards, whilst still providing support for APEX 5.0.x. You can now execute the defined APEX validations for individual form items e.g. on change, using the “FOEX Form Item Validation” action, rather than validating the entire form which you had to do in previous versions. You can now choose to execute any scripts that are contained within your HTML on region refresh. In this version to support Oracle DB 12.2 we have had to rename all the PLJSON types e.g. Due to the form submission changes in APEX 5.1 the file browse item will no longer upload via a single Form POST and will do so using a chunked base64 encoded series of A JAX calls using HTML5 File Reader API. We have also added the ability to restrict file types and file size and you will see a progress bar during the upload of the file. FXP-3041 - Date is not showing when format is "DD-Month-YYYY"
To check the full release notes which include the new features and functionality provided by FOEX 3.0, please click here. in order to support APEX 5.1, we no longer upload files via an iframe. Instead we upload the file in bas64 encoded chunks via AJAX using the HTML5 File API. This means that the file browse item can now restrict files to specific file extensions and also set a maximum file size limit. FXP-2904 - Add error HREF and null value support to the display image plugin. New additional config attributes “errorHref”:”[some url]”, “nullValue”:”about:blank"
FXP-2701 - Refresh of a form region with a file browse item which is not rendered raises "Cannot read property 'isHidden' of undefined"
FXP-2699 - FXP_UTILS.use_rtl can raise "ORA-1403 no data found"
FXP-2522 - Grid search issue when combining "AND NOT"
FXP-2474 - Tree grid search raises error "Query must begin with SELECT or WITH"
FXP-2467 - Grid selection tracker page item is incorrectly retaining selections across pagination, search etc. Grid Multiselection – choose from 4 different types of selection modes and save selections within a page item of your choice. Note: when enabling multi selection on the grid end users will need to use 2 clicks to edit a record. You can override this by including “clicksToEdit”:1 in the additional config plugin setting. Grid Cascading LOV Support – enabled by adding grid column aliases to your query and specifying the parent column within FOEX Settings. Editable Tree Grid – we have added editing support similar to the grid in functionality, including support for easily saving tree nodes, which have been moved via drag and drop. Master Detail – using this dynamic action plugin you can setup master detail relationships between grids, tree grids, forms, charts, list views, and big numbers. You can create multi-level relationships e.g. MDD, MDDD etc. Big Number – display large numbers with optional: small numbers in the top right hand corner, font awesome icons, and control colour and fonts. The plugin also includes context menu support. Static Content – display HTML in your pages with AJAX refresh capability. Splitter – resize, collapse, and expand regions in a HBOX or VBOX layouts similar to panes. See the documentation app for a demonstration of each of the new features. FXP-2038 Calling grid refresh rows on a form item that is part of a form after a delete operation raises: "ORA- 30625: method dispatch on NULL SELF argument is disallowed"
Grid & Grid Combo generic search improvements. You can now use multiple keyword searching and use AND OR NOT operators. Numeric and Date comparators (>,<,>=,<=,!=) support has also been provided for grid columns with underlying number or date data types. Case sensitivity searching can be enabled via the search menu by the end user. Search help text has been provided via the search menu. FXP-2043 Tree grid raises "Uncaught ReferenceError: me is not defined" when tree data loading is set to "Load on Page Load"
FXP-2086 FOEX Demo install fails when installing demo data into a non-english database due to invalid number format. FXP-2126 Popup LOV showing old search value when the LOV is cleared and the LOV has no initial value. in the tree additional config. HBOX/VBOX layouts can now have fixed sized regions and scrolling capability. Set autoscroll to yes on the pane/layout plugin and then set set a fixed height on child regions for VBOX layouts and a fixed width on child regions of HBOX layouts and their flex value to Zero. Grid sorting has been changed for VARCHAR/CHAR columns to sort case insensitively. This also works for LOV columns but they must have a VARCHAR/CHAR data type in the grid query. If your LOV column has a return type which is a number data type add a to_char() around it. To hide the tree/grid search column selector menu please include “hideSearchMenu”:true in the additional config. Message Box now supports wait for result. So actions are paused until OK is clicked for prompts, alerts, confirmations and actions are cancelled on cancel button click. ORA-20001: The Grid does not currently support the combination of infinite/buffered scrolling and editing. Please either use a pagination scheme or set maximum rows to your page size in the report properties. This is because "No Pagination" has been set but the number of rows does not match maximum row query count and grid editing is enabled. Please choose any other pagination scheme than the "- No Pagination Selected -" scheme. FXP-1889 Provide the ability to customize the tree grid buttons that are provided e.g. expand/collapse/refresh using the additional config setting e.g. FXP-1884 Provide the capability to override the region title using additional config setting "title"
FXP-1852 Provide additional actions to the form e.g. clear the dirty status, discard changes, enable, disable etc. FXP-1760 Provide an option to not autoload the grid combo, and to only load when searched. FXP-1758 Change the default checkChangeEvents behaviour on all grid column editors to exclude keyup. FXP-1755 Add the column context info to the aftersetitems event in the grid set column value on column change action. FXP-1958 Cascading LOV does not clear dependent LOV cached search values causing the same search value to be ignored after a selection on the parent. FXP-1952 In Chrome 43 charts can fail to render on load. FXP-1929 Cascading LOV issue in IE, value is shown momentarily then erased. FXP-1845 Popup LOV shadow column is being validated which results in the maximum character length of 24 not 27 characters. FXP-1836 Ensure that all grid file download format masks use content disposition "Attachment"
FXP-1831 Popup LOV local & remote store set value issue when Force Selection is "No". FXP-1814 Post calculation is not being honoured for form items on page load. FXP-1807 Tabbing is broken in cell edit mode, it can only advance 1 row before stopping. FXP-1762 Only one cycle button can be added to a region, if you add additional cycle buttons to the same region they are not rendered. FXP-1684 "Display as Text, based on LOV, does not save State)", the underlying database column is numeric, and the LOV returns a character value, the resulting value in the grid column is "NaN"
FXP-1639 Create new action within the grid actions to add rows to a grid and duplicate rows. FXP-1606 Cross page refreshing and setting items improvement to support cross tab operations opened by content loader and window open. FXP-1735 Form scrolling to the top in some circumstances when a checkbox or combo changes on long forms and scrolling has occurred. FXP-1715 $v NLS Number Issue, returns in raw number format rather than string format. FXP-1709 Grid file download format mask: File download error: "An unhandled exception occurred. Response could not be read !" FXP-1704 Row editor can move across rows when edits are outstanding, and loses the changes. FXP-1679 All lazily rendered regions need to be able to be referenced in dynamic actions when not yet rendered. FXP-1676 Page items need to be able to be referenced in dynamic actions when not yet rendered, but the form is rendered. FXP-1662 Delete selected row grid action bug, "cancelEdit is undefined"
FXP-1652 LOV Page Item setting is adding a trailing "dot" in some circumstances which we do not recognize. FXP-1648 Grid null values are being reported as "null" for column links and Popup LOV columns with display extra values set to "Yes"
APEX 4.1 support has been dropped. V2.0.0 supports APEX 4.2 only, we plan to add support for APEX 5.0 shortly after its public release in a new version of FOEX e.g. 2.0.1. (Grid) highlighting has changed for cell editing your must change the prefix of "x-grid-cell" to "x-grid-cell-headerId". Refer to the Grid Highlighting demo in the documentation application which includes extra CSS settings for row selection and row hover. Remove the !important from row highlighting CSS, leave in place for cell highlighting. E.g. (Form) ) Form CRUD processing security has been enhanced. Read Only item default values will be computed serverside and updated in session state for the CREATE operation only if their current session state value is NULL. This is to ensure that they pass any NOT NULL validation checks and adhere to standard APEX behaviour. (Button) All FOEX Button click handling dynamic actions should be moved over to "FOEX Button - Normal Button Click" to ensure that toolbar overflow handling works correctly as well as ensuring actions don’t fire on disabled buttons. (Menu Items, Context menu items, Button Menu Items) All dynamic actions for these types should listen to the context menu/menu item click event (not a regular click event and an ID jQuery selector) and use a condition to filter for the this.data.menu.item.id="STATIC_ID". (Menu Items, Context menu items, Button Menu Items) If you have defined URL links in your context menu, button menu, toobar menu's and you want them to replace the current page rather than using a content loader/window open dynamic action then you need to include "fxFollowLinks": true within the custom config. (Documentation Plugin) The background colouring of the plugin has been changed to be consistent with the chosen theme colouring. Chart Plugin with support 8 chart types and multi series support. FXP-1434 Disabled fields are being included in the form submit POST with blank entries. FXP-1417 Column link substitutions need to be URI encoded to support symbols in URL such as "+" etc. FXP-1402 Grid Download Format Mask issue for primary key values with "+" sign. No data Found when clicking on the link. FXP-1386 Fix issue with page submit when enter key triggered with only one field on he page. FXP-1385 Grid filtering issue when certain characters are used e.g. "! "#ABC"
FXP-1377 Record navigation is broken when a tree combo is in use and the picker has been expanded raises JS error "undefined is not a function"
(Grid) apex_application.g_request is now set during grid DML operations which means :REQUEST or v('REQUEST') can now be referenced in conditions. (Grid) A grid based on a PLSQL function can now be made editable but a processing procedure override must be used. (Content Loader) URL(s) that only differentiate by item/value settings can automatically trigger a refresh of the loaded page rather than a full reload. See page 8014 in the documentation application for an example. (Content Loader) you can now control whether opened content can be closed or not, in previous versions all content opened was closeable. FXP-1268 the font size buttons are still enabled on the html editor when show font is set to "No"
FXP-1188 Ext JS Bug: readOnlyCls not being applied on some item types e.g. number, date, combo any form item that has extended the Trigger class. FXP-1148 Grid Combo & Tree Combo set session state for all items not working as expected. FXP-1117 Grid Search dynamic action raised "me.field is undefined" when execute and the grid has not yet been rendered. FXP-1114 modplsql: Type mismatch in header - caused by an invalid parameter f50. APEX Listener was not affected. (Settings) The FOEX Settings plugin has been renamed to FOEX Application Settings. (Settings) A new plugin called FOEX Page Settings has been introduced. This plugin allows you to override Application level settings on a page by page basis. When using this plugin you will include it on the page with “No Parent Region” defined. This is different to the FOEX Application Settings which you do not need to include on any pages. You can see page 6 in the documentation application as an example. (Theme) A new CSS scoped version of the blue and grey theme has been included to reduce the impact of Ext JS theme styling on standard APEX components. You would choose this theme when you are using FOEX components in standalone mode on standard APEX pages. E.g. grid or tree grid. .You can use the Page Settings plugin to include this scoped version on only the pages that require it if you use a combination of FOEX pages and standard APEX pages. (Grid) The Grid Row Refresh action will now add rows to the grid if the Primary Key value you use is not located in the grid but found within the grid query when refreshing. This is useful when using a form to create new records in the grid. You can avoid having to refresh the entire grid contents to pick up the new record. (Grid) A new cell click event has been added and the Grid Set Item Values action has been modified to support this event to allow you to set page items with the cell value. (Grid) Timestamps are now supported by the Grid. 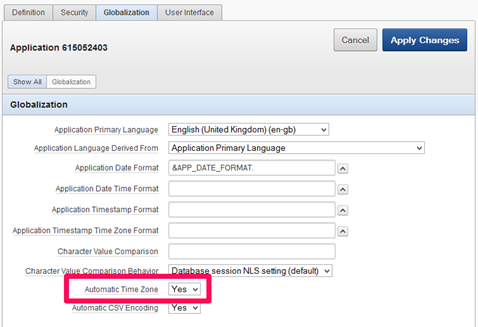 If using localtimezone you need to ensure you have correctly set your offset/timezone using the standard APEX mechanism e.g. (Button) To avoid issues with standard buttons responding to click events when disabled please ensure your dynamic action event listens to the "FOEX Button – Normal Button Click" event instead of the regular “click” event. FXP-1062 Treegrid CSV export is including hidden columns ID,PID,URL,INFO,CUSTOM etc. FXP-1052 Read only form setting is not reset when outputting other form regions. FXP-964 After refresh of Button menu it loses the "FOEX Button - Menu Item Click"
FXP-961 Shuttle item is returning valid when the plugin value is an empty string e.g. "" FXP-942 Fix Checkbox & Radio LOV display value to support double quotes, like breaks etc. FXP-1017 Add the group_id optional column to the button menu to use with the content loader and sharing tabs etc. FXP-941 Add a new dynamic action to empty a grid without refreshing from the server. FXP-936 Allow the validation of a non DML Form. (Grid) "Display as Text (Saves State)" has been switched from a read only column type to editable. (Grid & Form) The following classes have been added to framework buttons for styling capability. FXP-884 List View set item session state is not working correctly. FXP-850 Cancel button leaves blank row after user first tries to update the row but a validation failure occurs. 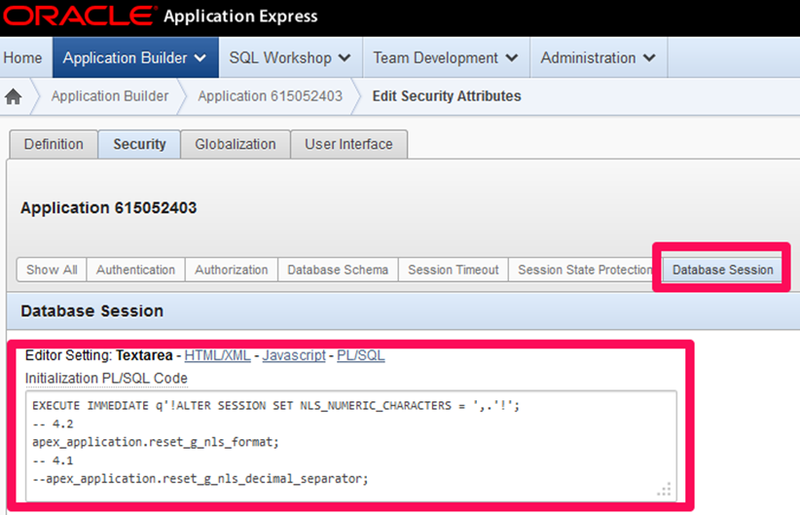 FXP-841 Form reset needs more documentation which describes the behaviour of "Set Session State"
FXP-840 Serverside validations are firing for a form delete when a required item is NULL and button execute validations is set to "No"
FXP-839 Local Form Reset and "Wait For Result" is checked additional TRUE DA's are not run. FXP-796 Version file extension is added to additional CSS & JS in FOEX Settings but breaks for foex/r/1092015/files/static/v1/ etc. FXP-790 Add support for refreshing/accessing page items when they are not yet rendered. FXP-784 Content Loader region needs to have the option to refresh or reload when apexrrefresh is triggered. FXP-875 Add an additional class to all FOEX defined buttons to uniquely style them. FXP-832 Address event bubbling when standard apexbefore/after refresh events can affect parent regions. FXP-785 Add support to the gird to treat "Display as Text (saves state)" as an editable column not read only. For Theme 24 users we have removed the Interactive Report Styling override for the search box since this was impacting theme 25 and theme 26. For theme 24 users you need to add the following style overrides in your page template(s) before the <body> tag. The page can now be submitted when a FOEX form plugin is defined on the page. In previous versions we disabled the page from being submitted. This has been implemented to allow you to use standard APEX tabs in your page designs. The impact of this change all form plugin items, toolbar items will not submit any values or be updated in session state with the page submit. Only standard APEX items that are contained in standard APEX regions will have their values submitted and updated in session state. Additionally buttons that have a setting of "Submit" and do not have a "Database Action" defined will now submit the page If you do not wish these type of buttons to submit the page then they need to be modified and set to "Defined by Dynamic Action". Additionally all form plugins with hidden protected items will still automatically disable page submission therefore you need to disable protection on these hidden items if you want to submit a page with a FOEX form plugin on it. All other page items which you set the value of locally on the page must have their protected status set to "No" to avoid an item value protection exception on page submit. For all grids which have a primary key defined in the grid plugin settings and have the export data to CSV option enabled, 2 new options will be available within a split (menu) button. The default button action is still to export as per previous versions but clicking on the menu you now have the 2 additional options "Export Visible Rows Only" i.e. 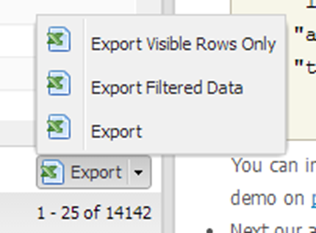 you only export the data that’s currently in the grid and “Export Filtered Data” which will export all data that matches the filters applied i.e. data shown on the page and also what has yet to be fetched via pagination. FXP-751 - Grid columns with date and numeric format masks are not sorting properly. FXP-749 - Allowing the page to be submitted for forms with protected items causes an error when the form is loaded. FXP-703 - Remove the apex.submit disablement in the Form plugin so that pages can be submitted in hybrid mode. FXP-698 - Viewport and desktop are moving off screen when a window is moved below the viewport. FXP-747 - Allow windows to be refreshed via AJAX when just the page item and values differ in the URL if close method is set to "hide"
FXP-744 - Allow grid column select list editors to be refreshable. Desktop plugin based on a DB table must have a new column called CUSTOM added. Form pagination by default now has FIRST/LAST pagination options in addition to NEXT/PREVIOUS when an order by clause is added to the form plugin. Use "excludeFirstLastBtns":true in the additional config to disable. First is always enabled. If no record is found a blank form is shown. FXP-668 - Form loading isn't working correctly for the first load in a blank form when the primary key is set. FXP-656 - Set column value on column change firing when changing row editor record. FXP-611 - Documentation plugin to be refreshable in full, not just refresh the current content. FXP-596 - "Form Action DA - Validate" does not continue for local validations when wait for result is checked. FXP-568 - Form Item sources other than DB Column are not executed correctly when using form pagination. FXP-423 – option to add loading indicator for cascading LOVs that are being refreshed. FXP-211 - Validation to make sure a pane is only a child of another pane/layout when the border layout is selected. FXP-665 - Add a HTML Region option to the "Create FOEX Region"
FXP-563 - Add extra action attribute to the cycle button menu entries since using label text is not ideal. In this release we have changed the behavior of buttons positioning in the form and grid. Buttons will now be aligned to the left or right based on their alignment setting. For the form, buttons can be positioned at the top or bottom but not both. For the grid all buttons will remain at the top regardless of any different setting. Button items are now supported within forms and will be included on the page. Previously if one was defined it was omitted from the form. The Twitter plugin is broken in all FOEX versions as the twitter v1.0 search API was shutdown on June 12th, which we weren’t aware of or expecting. The new v1.1 API requires OAuth which requires a number of significant changes to the plugin. We will be addressing this in a future release. Our apologies for any inconvenience. FXP-480 - Grid Scrollbar detatching issue still arises occasionally even after implemented workaround. Additional workaround added. FXP-493 - Allow the ability to manual save for the row editor plugin instead of auto saving if the developer wishes by adding “manualSync”:true to the grid additional config. FXP-471 - Ability to open new windows on the text from within a child iframe window. FXP-442 - Combo refreshed when hidden does not remove the load mask.